The votes are in, and the SOLIDWORKS 2016 Beta users have chosen the new Breadcrumbs Selection tool as the winner for the best new feature of SOLIDWORKS 2016. Breadcrumbs Selection allows you to maximize the use of your graphics area for design while at the same time speeding up selection and command execution. You can hide the FeatureManager and still make selections at any specific level of the assembly, part or feature hierarchy – and actually do it quicker and with less mouse travel. Now I know that sounds like a contradiction – you’re probably thinking, if I hide my FeatureManager, isn’t it going to make selection harder, not easier? How am I going to select a specific level, let’s say a sketch in a feature, if I can’t even see the FeatureManager? The answer, of course, is Breadcrumbs Selection. As the name indicates, Breadcrumbs Selection automatically displays a graphical path to what you have selected in your model. Just select on your model, and the Breadcrumbs path appears. Then you can select the specific level within the Breadcrumbs Selection path. This then allows access to relevant commands instantly. Breadcrumbs Selection works by categorizing commands relevant to different features based on your selection. And even better, you can snap the Breadcrumbs toolbar to your mouse location by simply pressing the ‘D’ key – this, of course, significantly reduces mouse travel by providing access to the command where you currently are located on the screen – no need to move all the way across the screen to select a command. Pressing the “D” key a second time exits the command and returns you to the top level. For example, when you select a face icon in the Breadcrumbs path, you have access to all of the commands or actions relevant to the face. Similarly, selecting the feature, body, parts, subassemblies and assemblies delivers filtered commands for each level to get to the exact tool you want. 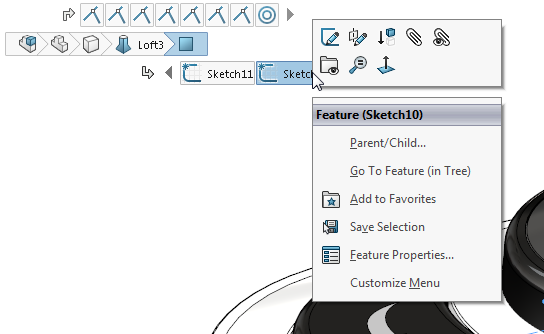 For features, you can select underlying sketches and immediately edit them. This speeds up the process of making changes. The new Breadcrumbs Selection tool for SOLIDWORKS 2016 is a great example of how SOLIDWORKS continues to help speed up design by getting the CAD system out of your way! This post was originally published by Craig Therrien on the SOLIDWORKS Blog and is being reposted here with permission from Dassault Systemes SolidWorks Corporation.